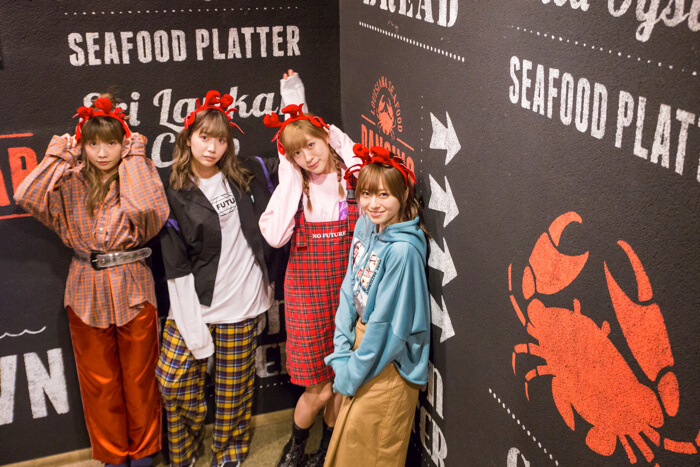 All-female band SILENT SIREN announced a new article feature on MOSHI MOSHI NIPPON in February. In this new series they leave it to their curiosity and visit different hot spots in Japan. 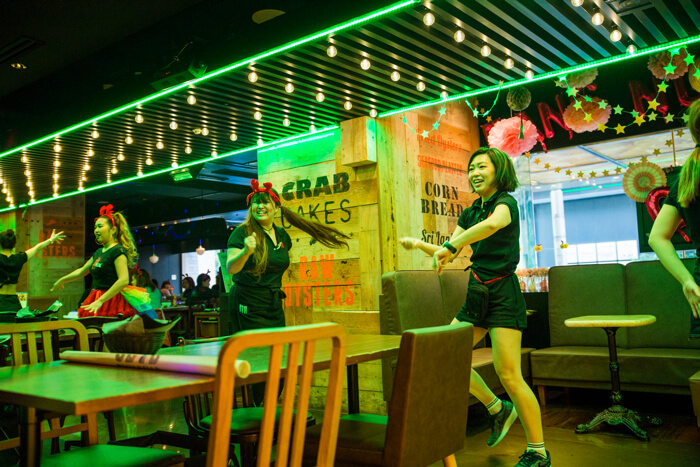 For the first entry, they headed to Dancing Crab, a popular restaurant where you can enjoy eating seafood with your hands. It wouldn’t be an exaggeration to call this place an‘eating attraction’! Before sitting down to eat the food, wash your hands with the handwash machine in the restaurant. The machine is decorated with a pink coloured ribbon curtain(until 4/15) and serves as a premonition of the ‘eating festival’ that’s about to start. Upon arriving at their seats, the nimble staff quickly laid out a sheet which bears the restaurant’s logo. 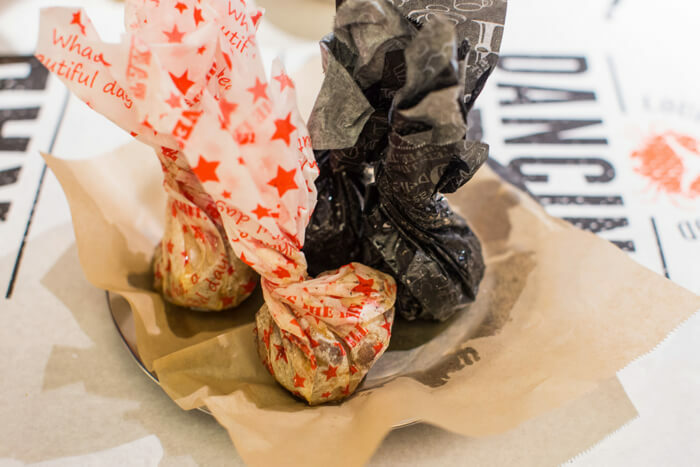 The rolled paper sheets do not make everything look disorderly – they conceal the table in an instant. There’s a thrilling feeling to it as if watching some kind of magic show. Plates do not arrive. Instead, this sheet is where each piece of food will be placed! When the drinks arrived, the lights dimmed, and high-tension music began playing. It was as if something was about to happen – all four of them had bewildered looks on their faces. When the lights changed do something like that of being in a club, the staff member, dressed in a skirt, suddenly turned into a dancer and began performing. The customers and staff become one, and for just this one moment, everybody in there became party people! Dance time strikes once every hour, so if you’re there you’ll definitely be able to experience it. In any case, their dancing was agile and skillful. 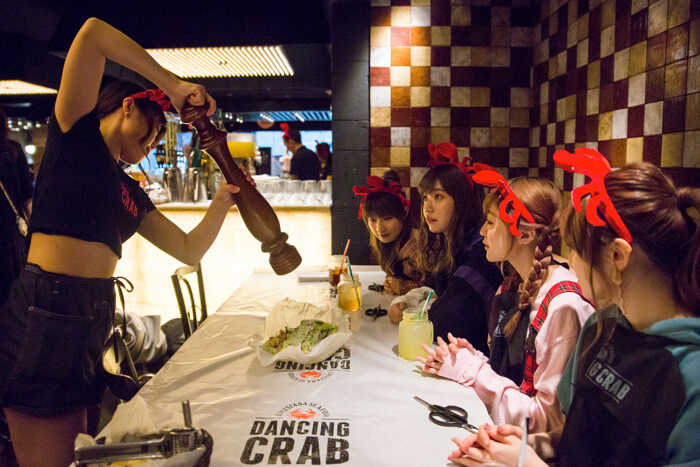 SILENT SIREN raised their drinks and enjoyed the dance too. Their pre-meal mood rose to excitement. The staff gave a high-five and came to the table. After dance time, the first item of the lunch course arrived – a classic Caeser salad. Cheese is sprinkled all over. Of course, the salad is eaten by hand too. The lettuce even looks crunchy. Biting into it lets out a crisp sound. 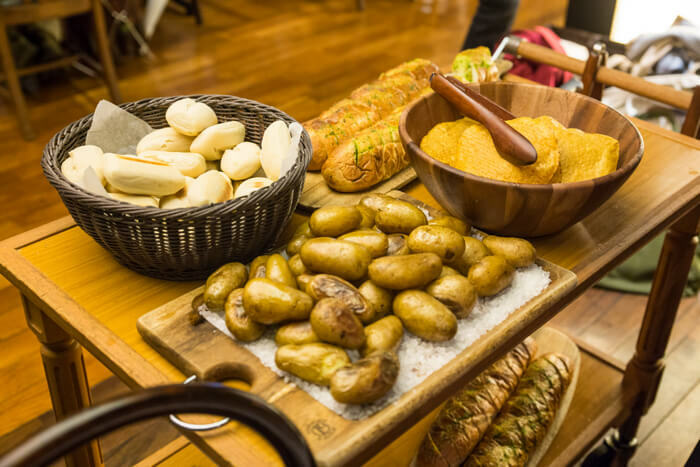 The lunch menu set comes with pasta, potatoes and all-you-can eat bread. Today’s bread comes in two flavours: plain and garlic. Flavors change depends on the day. Everything is brought to tables on a serving trolley by stuff carrying. It even came with soup. Then, the main dish arrived! The combo bag for the lunch meal “Ichioshi! Zeitaku Zuwaigani Course” (¥2,778) is released excitingly onto the table from a vinyl bag. Steam rose into the air together with a hearty fragrance of seafood and spicy sauce. Each of the members clapped involuntarily as their five senses were tickled. There are 4 kinds of sauce. They went with the popular signature sauce. It’s an original Cajun sauce combination of onion, garlic and Cajun spice infused tomato puree mixed with fish sauce (the secret ingredient). 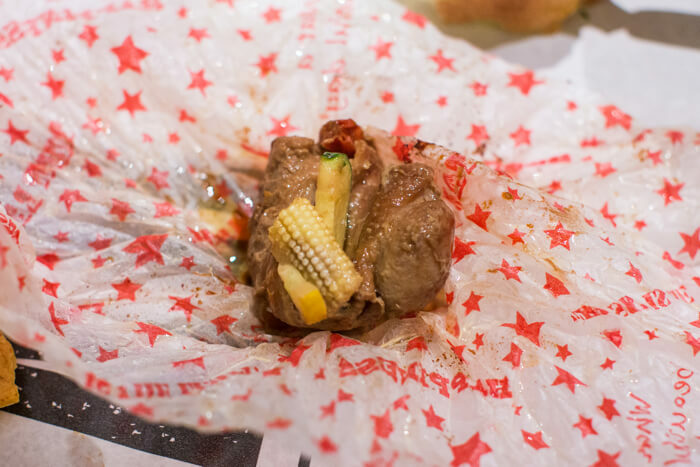 All that’s left was to tuck in. 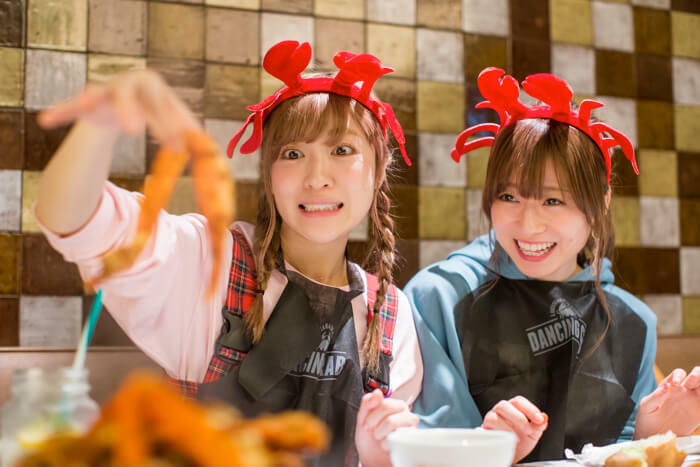 Yukarun was fixated on Suu who took apart the crab with real skill. 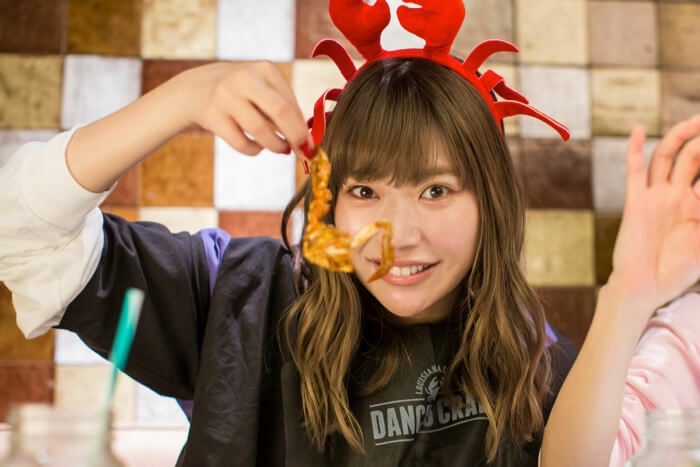 As well as snow crab, they also include milky crab and watarigani. The variety of crabs change each time. 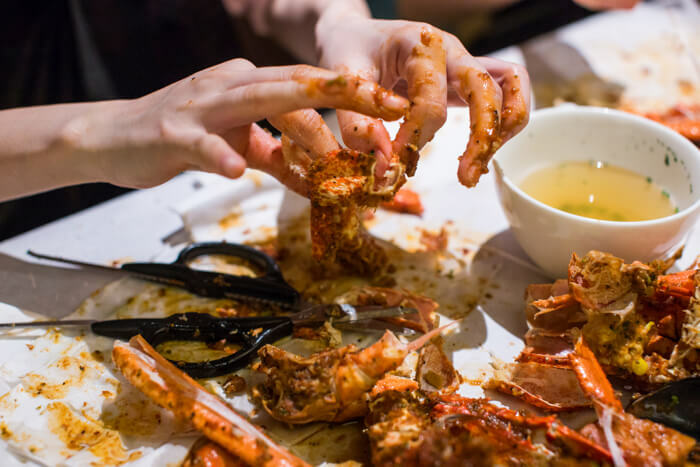 Just when they thought the seafood they’d be eating with their hands would be cool, it actually arrived piping hot! 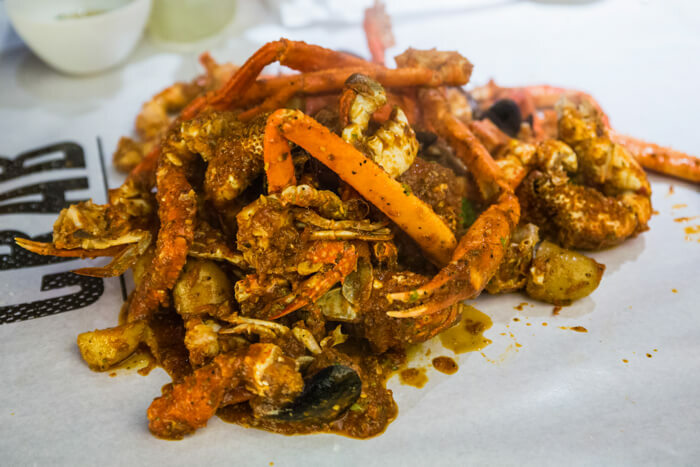 Biting into the crab wildly! 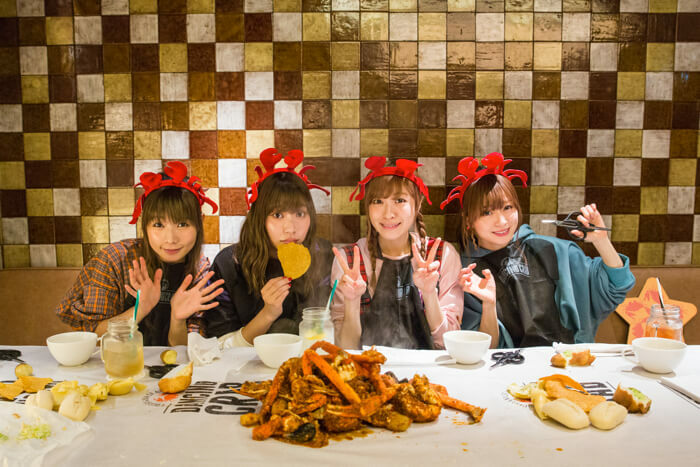 Ainyan and the crab’s looong legs! Eating the bread, pasta and potatoes together with sauce makes it taste good! 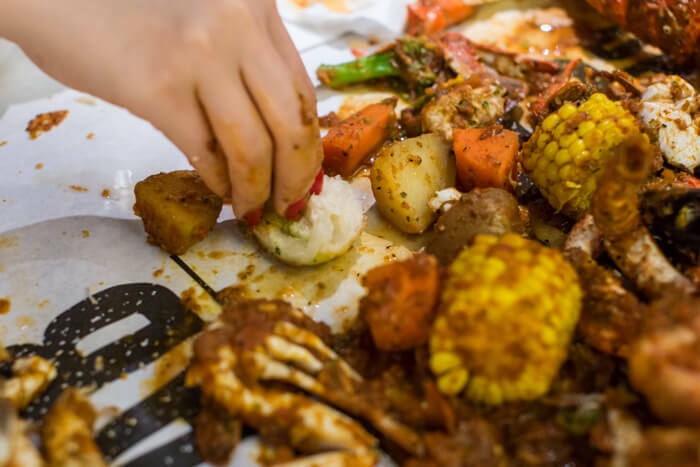 As well as crab there was also thickly sliced prawns, octopus, mussels, corn, potatoes, carrots, and bacon. This is the restaurant’s way of filling you up so that you don’t grow tired of just eating seafood. There isn’t just seafood though. They also ordered a portion of friend pepper chicken (¥640). The juicy meat melts as it enters your mouth. The members were totally immersed in their extraordinary day of eating food by hand. They were fully concentrated on peeling the skin of the crab! 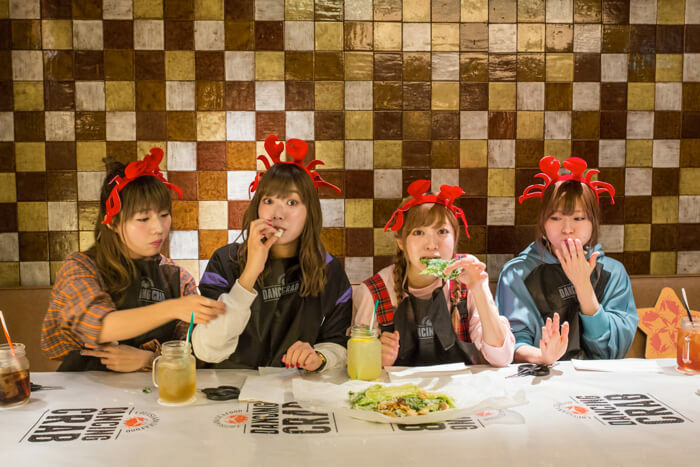 At the start, the four members were surprised and timid when eating, but they soon opened up and by the end of it all, they weren’t at all bothered about their sauce-soaked fingers, they tucked into their food, engrossed. 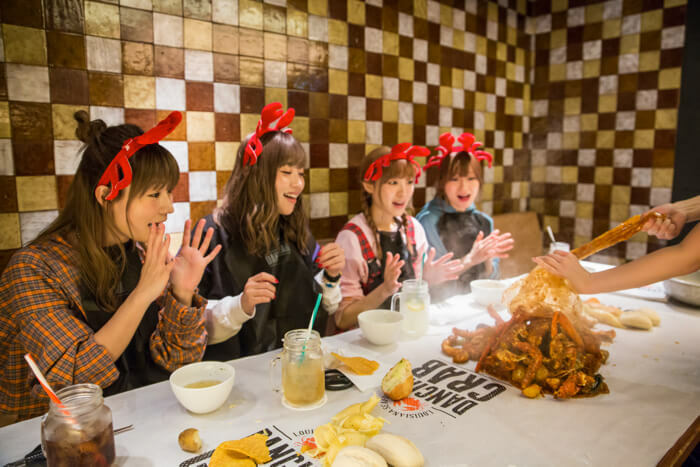 The exciting experience raised SILENT SIREN’s friendship. Where will they head to next? Look forward to the next entry! 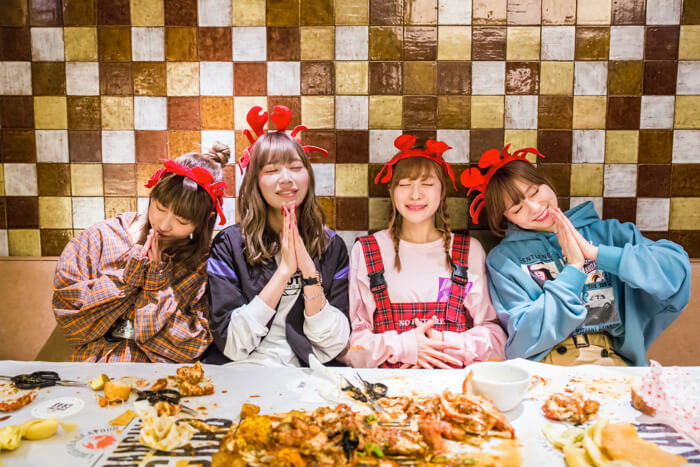 SILENT SIREN Begin Nationwide Solo Tour Across Japan! 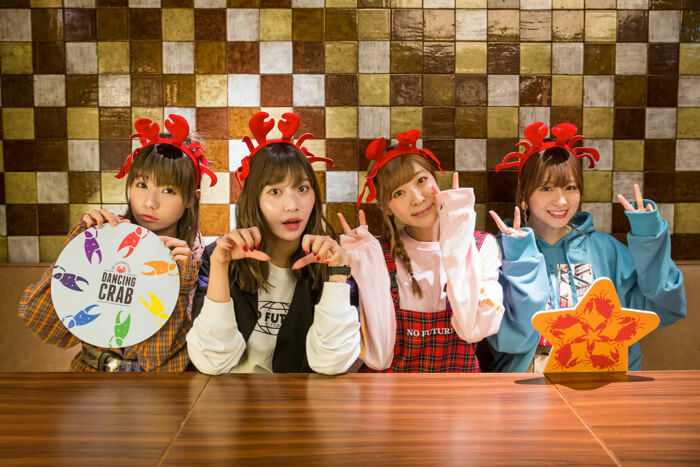 SILENT SIREN released the teaser movie of their live!